Meet The Counselors’ 2019 Leadership team: Julie L. Melander, CRE, a real estate advisor based in Tampa, Fla., is the 2019 chair of the CRE board of directors; Michel M. Couillard, CRE, president and CEO, Busac Real Estate, Montreal, Quebec, Canada, is 2019 first vice chair; Marilee A. Utter, CRE, president, Citiventure Associates, LLC, Denver, serves as 2019 second vice chair. For more information about these Counselors, click here. Counselors of Real Estate are invited to submit their nomination now for the 2019 James Felt Creative Counseling Award. This award celebrates outstanding achievement and ingenuity by members of The Counselors. Any Counselor may nominate their own work or that of a fellow Counselor. The deadline is March 13, 2019.
a statement detailing the “Creativity Component” of the engagement. Prior-year submissions may be reconsidered, but must be resubmitted to be considered in 2019. Submissions should be emailed to Paul Coady, Manager of CRE Services, at: pcoady@cre.org. To learn more about the award and past recipients, visit the CRE website. The Counselors’ 2018 Annual Convention in Charleston, S.C., October 21-24 attracted near-record attendance. To review the schedule and speakers, click here. A one-of-a-kind tour of Boeing’s Charleston-based assembly and delivery facility where 787 Dreamliner aircraft are produced. The facility is the company’s first 100 percent renewable energy site. 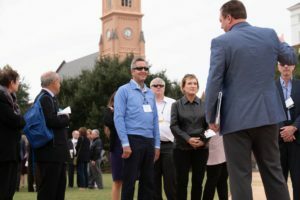 Additional development tours, guided by real estate “insiders,” explored the challenges of building and developing new properties in an iconic historic city; and close-up views and discussions about some of Charleston’s newest development projects. An opening address by the mayor of Charleston, John Tecklenberg, whose emphasis on improving citizens’ quality of life has included projects to address housing affordability and homelessness, flood control, and increased opportunity for employment. Program sessions focused on how Charleston attracted new industry to the region; growth of logistics strategies and the companies which streamline delivery of goods; company-sponsored job training to attract and retain a loyal workforce; realities of blockchain in real estate transactions; and lessons learned about inclusiveness and negotiation on matters such as real estate planning, development, and politics, from a mayor who served in office more than 40 years. 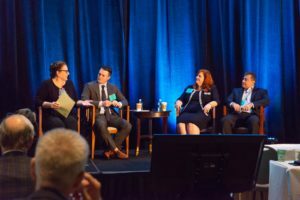 CRE Consulting Corps clients’ perspectives on the value of utilizing the Corps in addressing real estate portfolio management; panelists were real estate directors from two Catholic Church dioceses and Counselors who have led such Corps projects. A CRE Open Forum focused on understanding The Counselors’ Invitation Process (a session exclusively for Counselors). 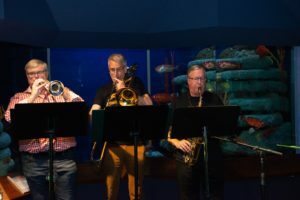 A performance by the popular CRE Band, Sound Counsel, at the Chair’s Celebration event at the Charleston Aquarium. For additional photos from Charleston, click here. 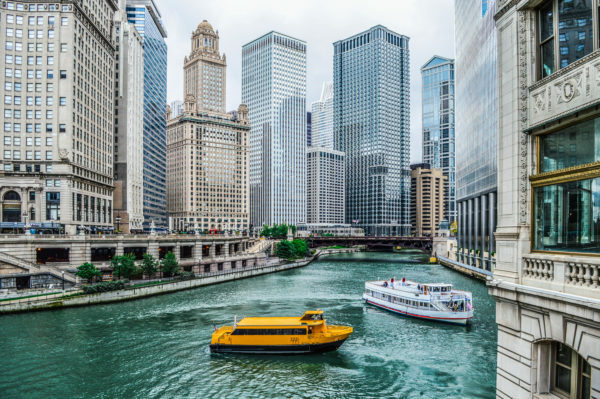 The 2019 CRE Midyear Meetings will take place April 28-30 in Chicago. Focused on Real Estate Disruptors, the program will not only define these hot button issues, but share how new (and ever increasing) technology, creativity and innovation will affect every real estate business owner and executive in practice today…not if, but when–and how. Mary Ludgin, Managing Director and Head of Global Research at Heitman, is just one of the highly sought-after headline speakers whose deep knowledge of disruptors and practical insight offer unique value to Counselors–those who plan to adapt and prosper, not just survive, in the rapidly changing real estate industry. The European Chapter will present their annual London Technical Seminar February 27-28. This year, the program focuses on BREXIT. For more information and to register, click here. On April 4, the New England Chapter will present a project tour of Bulfinch Triangle with the HYM Investments Group and a reception with panel discussion. Counselors are welcome to attend CRE Chapter events if they live, practice in or are visiting the area. The CRE Utah Chapter hosted a first-hand look at a co-location and data center facility operated by Aligned Energy. The Counselors’ Southern California Chapter joined with Lamda Alpha to present a 2019 Economic Forecast by Dr. Ed Coulson, Professor of Economics & Director of the Center of Real Estate at The University of California/Irvine. The CRE New Jersey Chapter hosted John Palmieri, Deputy Mayor of Newark, for economic growth, transportation, and infrastructure. The Counselors’ Connecticut Chapter heard from Mike Freimuth, Executive Director of the Capital Regional Development Authority. Chapter events are updated frequently and can be reviewed at any time on the CRE website. The Counselors’ publications are always available on the CRE website. Counselors receive the The Counselor quarterly, both by email and in print. Real Estate Issues articles are published to the CRE website frequently, and Counselors receive the articles via email. To suggest a business contact or client to receive either publication (or both), please email Alyssa Bray, Digital Media Communications Manager, at abray@cre.org. The latest issue of The Counselor focuses on the real estate market in the 10 years since the recession of 2008. This publication is produced by CRE members for both fellow Counselors and business leaders, Counselors’ clients, those interested in potential membership in The Counselors, and the media. “The Devastating Impact of Storm Surge on Coastal Communities” by V. Lynn Hammett, Ph.D., CG; Elaine Worzala, Ph.D., CRE; and Tom Springer, Ph.D.
“Disney Declares WARA” by Todd D. Jones, CRE, and Michael J. Mard, CPA/ABV, CPCU.